“It’s the most wonderful time of year…” That song should really be reapplied to springtime and the season opener of The Farmers Market! In most neighborhoods–unless you’re lucky enough to bask in year-long sunshine–April is the start of the season, when hundreds of people emerge from winter hibernation to commune with their farmers and growers in a simple quest for fresh, local food. Fresh produce, blooming flowers, music and family fun, yes please! Not only is this season of farmers markets a chance to get out and enjoy the fresh harvest, it’s also an opportunity to soak up some of that spring sunshine and commune with your neighbors and farmers. Celebrating this time of year has a huge positive impact on physical, environmental and community health. This year’s first Corvallis Farmers Market on April 20th was quite possibly the largest opener ever, with over 5,000 people in attendance. The streets were jam packed not only with vendors but with families, students, kids and, lots of dogs! Vendors were overflowing with goodies including fresh asparagus, strawberries, leafy greens and varieties of lettuce, onions, garlic, blooms, and of course plenty of baked goods. I filled my basket with fresh everbearing strawberries from Denison Farms, buttery greens from Fry Road Nursery & Garden and eggs and chicks from Afton Field Farm. One of my favorite booths was Corvallis Community Market Table, where everyone can sell at the market, no matter what size. The Market table is a place for small growers (or even back-yard gardeners!) to sell consignment at the farmer’s market. Every market (fresh food shopper) should be so lucky! Join in on the fresh food and fun this season at a market near you! 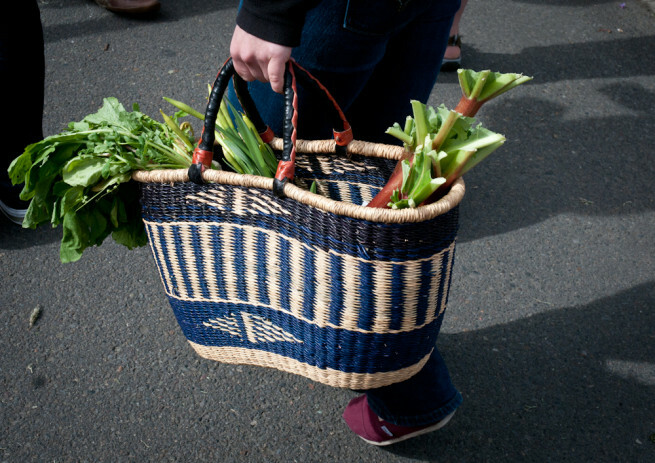 Dust your off your market basket, commune with your farmers and growers and stock up on the freshest picks of the season!